It’s not that mountain people want to frighten sweet, innocent newcomers, exactly. We simply want them to be prepared. We want them to be ready especially for two minor dangers: those that want to eat us and those that can squash us flat. We take in stride the creatures that want to eat us, hustling online to post mountain lion sightings and photos of bears on the patio. Full-time residents rarely call the sheriff to report lions and bears, because we know what often comes next when an animal with teeth and claws shows up in the flatlands, where deputies are trained. Cue Chopin’s Funeral March. We also sleep right through skunks and raccoons rustling around noisily at night. Beware of letting your cat roam outdoors; when a cat doesn’t come home, the natural conclusion is that it fed a bobcat or a coyote. As far as your head goes, don’t worry – the bald eagles won’t attack like eagles do in other places. Some things, however, might squash you flat. We love to tell stories about people squashed flat by rocks falling on their cars. In the stories, the victims are always flatlanders, never locals, as if falling boulders had radar for them. A victim who was driving a Smart Car the first time the story was told might wind up in a Ford F-350 as flat as a sheet of paper by the fourth or fifth telling. What will really nail newbies are the pine cones. We have pine cones like flatlanders have never seen, Coulter and Sugar pine cones as long as a forearm and as heavy as a sack of sugar. We capitalize on a liability with an annual Pine Cone Festival, not coincidentally held out in the open, not under pines. The big cones really can – and do – break windshields when they fall. They also hurt. A Coulter cone’s scales have little hooks on the ends. An encounter with a Coulter cone plummeting from 40 feet will come out looking like the losing end of a fight with a cactus. It could be worse. A couple of years ago, officials in eastern Australia set up barricades to keep people from becoming victims of a Bunya pine that was letting go of 22-pound cones from 90 feet. 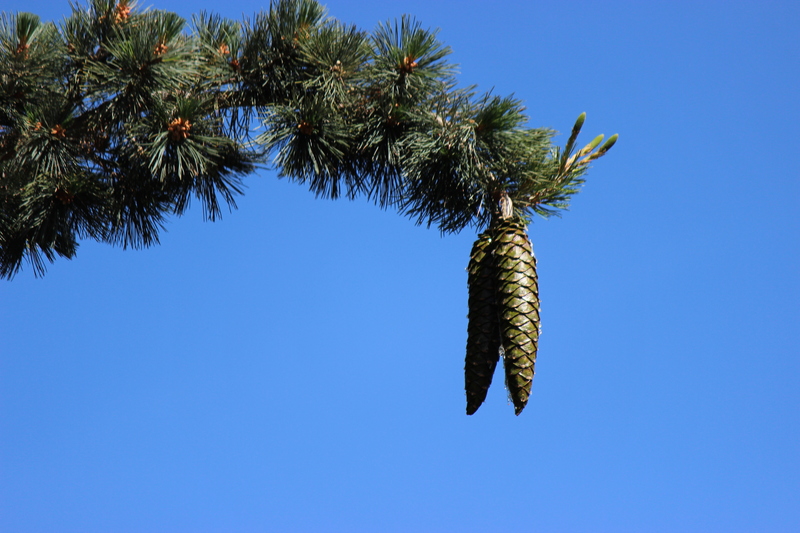 Our big pine cones are under construction right now on high limbs. Moral of the story: Look up, because it probably isn’t the claws and teeth that will get you. It’s the trees.